I'm usually pretty optimistic, but this long stretch of snowed-in, sunless days, being house-bound in the middle of nowhere, PA has us all a little on edge. A friend of mine pokes fun at "February" on her blog, calling it the most "wretched month" and today, it feels like it certainly fits that description. I didn't meet my goal today. I didn't serve anyone...not anyone outside of my own home, anyway. And, even then, I just barely feel like we survived our day at home. Normally, I would feel defeated at having not done what I had set out to do. 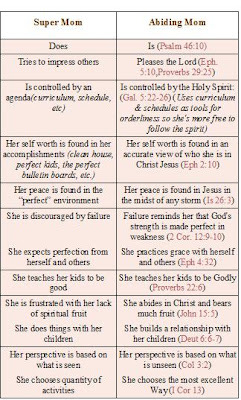 But then I read this chart comparing "Super Mom" to the "Christ-Centered Mom"on the blog Confessions of a Homeschooler, and it got me thinking about what it means to "practice grace" and that I might need to extend a little grace to myself today. If you have a hard time reading the chart above, click here to read the original/bigger version. I have printed it off and will be hanging it on my fridge for future reference. Day 16: We can't do everything we want to do always. But there is one thing that we can do. We can go easy on ourselves and others. oh, I'm sure you served your family...a bunch of times today!! or did your kids stay in their pjs all day? eat cheerios from the box? Never get a diaper change? No teeth brushed? Sure...you served your family...the most important people in your life. 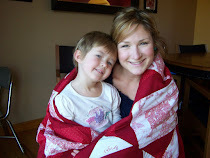 ps...I have a new blog name...you might want to update your blog list, if you get the chance! I feel the same way Jocelyn! It's amazing what a little sun and a trip to the grocery store can do for my morale. I think today Lily and I are going to bust out. Or at least try to...! I sure needed that today, February is very wretched, but half way over! Hurray! Thanks for your great post. Thank you Jocelyn, you always read my mind, I love you. Jocelyn, I see you serving everyone day in and day out, so don't give me that:) And to say that you barely survived the day is saying a lot when we've got 3 under five!